A visit to a prison is generally one met with timid emotions. Either you're visiting someone you know who's being detained in the prison, or you yourself have done something deserving serious punishment. It's funny how the strangest and sadest places are now flocked with tourisrs. In the past couple years I have visited two prisons for enjoyment. The Hanoi Hilton in Vietnam (a prison used to interrogate and torture prisoners, they were mostly American pilots), and Alcatraz. Alcatraz, was a place I had always wanted to visit. Today, I got just that -- going with 22 of my family and step-extended family. Alcatraz Island --a 22 acre Island located off the shore of San Francisco-- has served as a military base, high security prison, and Native American Occupation. A quick ferrey from the wharf, you can easily tour the Island (just make sure you get your tickets in advanced, and bring a sweater)! The Island was first documented by Juan Manuel de Ayala in 1775, he chartered SF Bay, and named the island "La Isla de los Alcatraces" which means "The Island of the Pelicans." I'm generally not a bird person, but who can't love cute little chicks? My step-cousin was fortunate enough to receive a little present from the pelicans, the white badge of Alcatraz is what tour guides called it. Here's one of the cells the prisoners lived in. It's not too bad. Not nice either, but I was expecting something much worse. Privileges: "You are entitled to food, clothing, shelter, and medical attention. Anything else that you get is a privilege. You earn your privilges by conducting yourself properly." If you didn't behave you went to an isolation room, basically the same thing but it's pitch-black and you're not allowed out of your cell. Being a high security prison full of dangerous criminals, there were several escape attempts. They claim that nobody ever successfully escaped. As the three prisoners that dug through the walls with a makeshift drill made out of a vacuum and spoons are said to have been lost at sea. That or there's a rumor they lived their lives in some spanish-speaking country. MythBusters investigated this myth, yep, it's possible! The other notable escape is known as the Battle of Alcatraz. They managed to get a hold of a gun, and kept the guards in their way captive. Security finally cornered the convicts, when they dropped grenades into areas where they thought the convicts were. Two days later, guards found the dead bodies of three of the convicts. The above picture is in memory of one of the guards who risked his life fufilling his duty. Other than a few escape attempts, most of the convicts in Alcatraz survived pretty well. Well enough, in fact, for 70 families (of security guards) to live on the Island. This is a picture of what was once the Warden's house. Children that lived on Alcatraz lived the normal life of any small town child. There was a general store on the island! But for everything else, including the school, the children ferried out to the mainland. After 29 years of running, budget cuts caused the Prison to close. There were many ideas of things to do with the Island, including making another Statue of Liberty, but there was a time when Native Americans protested on the Island. They used it as a symbol of their struggle. 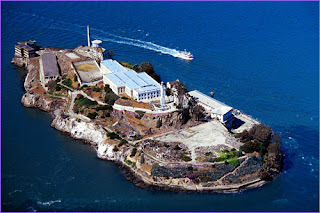 In 1972 Alcatraz became a National Park, a place for many of us to spend our money and learn about the place where Al Capone and Bird Man once resided! From the Island you can see a beautiful view of the San Francisco skyline. From the title, my first thought that this was about the upcoming tv show, Alcatraz, but this was much more interesting. What a cool trip to take! What made you want to visit Alcatraz? I just checked out the trailer for the show, it looks so good. I'm definitely going to watch it. Well, growing up in the Bay Area it was a touristy thing that I never got to do. Every year we'd be like, oh we'll go this year. But never did until now. I only wish I had got to go with my Mom, she would have loved it. i don't know if I'd ever do it again though. It was interesting, but not like Colosseum interesting. You go once, and it's great, but enough. Unless you go back years later I guess.